While in the Dominican Republic you might be interested in a few holes of golf. The Dominican Republic has some world class golf courses such as the Punta Espada golf course where the Cap Cana Championship tournament is held. The temperate weather and beautiful surroundings make the DR a great place to have a golf vacation. This list of available golf courses, golf clubs, and golf resorts can help you get started. Boasting a $1.6 million purse and a Winning Share of $240,000 the Cap Cana Championship golf tournament will be coming to the Dominican Republic on March 26 – March 28. The Cap Cana is part of the PGA Champions tour and is played this year at the Punta Espada golf course which was ranked as the best golf course of the Caribbean and Mexico by Golfweek magazine in it’s last published ranking. Cap Cana is just a few minutes from the Punta Cana airport on the southeast side of the island. Punta Cana is known for it’s beautiful beaches and pristine waters. If you are a Golf fan there couldn’t be a more gorgeous place to spend a few days watching some of golfs greatest players. Some of the top names that will be playing this year are Keith Fergus, Fred Couples, Mark Weibe, Bernard Langer and Eduardo Romero. 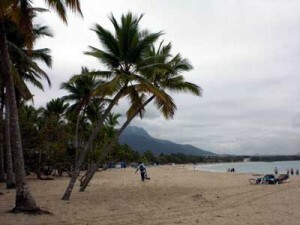 The Playa Dorada is one of the two more famous resort beaches in Puerto Plata, the second one being Costa Dorada. In case you are checking a map you will likely find the name of the city to be San Felipe de Puerto Plata although the locals just call it Puerto Plata. Playa Dorada is surrounded by the many resort hotels, many of them offer special “All Inclusive” rates for staying there. It’s said that there are 100,000 hotel beds in the city. Which gives you a little bit of an idea of how packed the beached can be in the main tourist season. It’s best to try and hit these beaches in the off-season.